NYSE Euronext publishes a handful of stock indices using stocks from the NYSE. There is a composite index, a top 100 index, a pair of international indices and some sector indices. The chart below shows the NYSE TMT Index ($NYY) with a 50-day and 200-day moving average. This index can be plotted using intraday data as well. 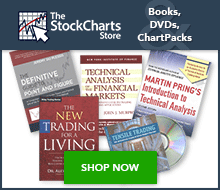 StockCharts.com users can access an up-to-date list of symbols for all our NYSE Equity Indices. From this list, click the “Mentions” icon to the right of a specific symbol for more details about the symbol, as well as recent mentions in Public ChartLists, blog articles, and more.